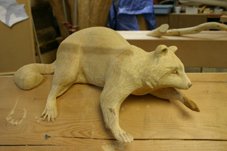 Client's timber frame material will be carved into raccoons. 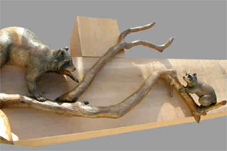 They will be mounted on one of timber beams. 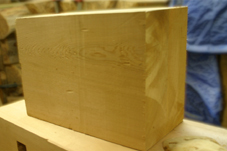 Outline has been cut out with bandsaw and the piece is mounted on a temporary block. 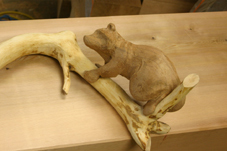 Raw branch is placed to check out the whole design. 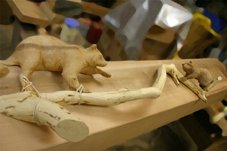 Right leg and arm will be attached. Mom raccoon's details are on now. 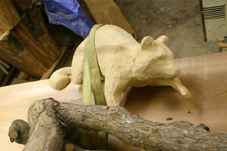 Baby raccoon is roughed out and tested on the branch. 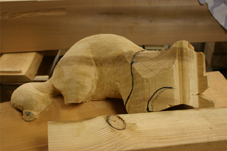 Carving stage is over. Coloring and staining completed. They are ready for new home.